While watching TV yesterday evening, I heard the ad for 7flix’s line up say, rather clearly, now available on more TVs or something to that effect. That alerted me to a change to Channel 7’s multiplex configuration, which means it’s time for yet another Freeview update. After only recently launching a full high definition service, they have decided to cave to user criticism by changing 7flix to have solely MPEG-2 576i video, and MPEG-1 audio. This ensures compatibility with all deployed set top boxes and TVs, and should result in no complaints about reception problems anymore. TV4ME remains off the air, since the HD channel launch. Surprisingly, there were a few people coming to this site looking for it, so I suppose a handful of people actually watched the channel. On a three hour capture at 7:45pm to 10:45pm, the bitrates showed that the main 7 Sydney service was slightly down, at around 3Mbit/s for the service, as was 7TWO. 7mate had slightly more, but not by much. 7HD had lost a tiny bit, which seems to have been given to 7flix, which has also lost the MPEG-4 audio stream, reclaiming its bitrate for video purposes. Unfortunately, 7flix still lags behind in bitrate compared to the rest of the standard definition line-up, with the vision lacking about 0.5Mbit/s compared to the rest of the standard def channels. Curiously, RACING.COM had a tiny bump up in bit-rate. 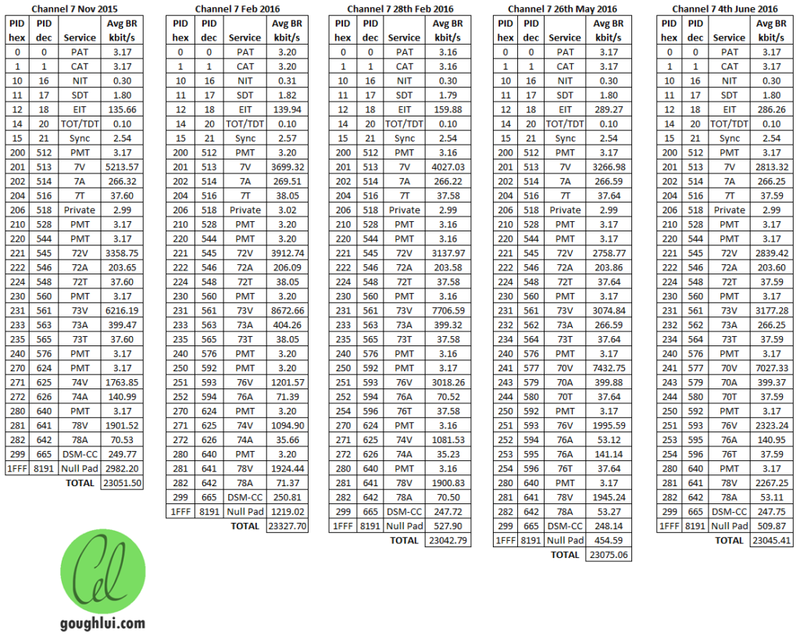 The updated PID table clearly shows that the secondary 7flix audio stream has been lost, and mux utilization remains within normal bounds. It seems the pressure and complaints about not being able to receive 7flix has resulted in a move on Seven Network’s behalf, reinstating the old MPEG-2 and MPEG-1 suite of codecs making the channel available on all DVB-T certified equipment. As a result, we lose the improved bitrate efficiency for both video and audio, and thus, a higher bitrate is needed to maintain the same subjective quality. To some extent, this was achieved by scrapping TV4ME, and by launching 7HD at a bitrate slightly less than the old 7mate but using a more efficient H.264 codec. This improves the HD experience, while freeing some bits for 7flix to use. 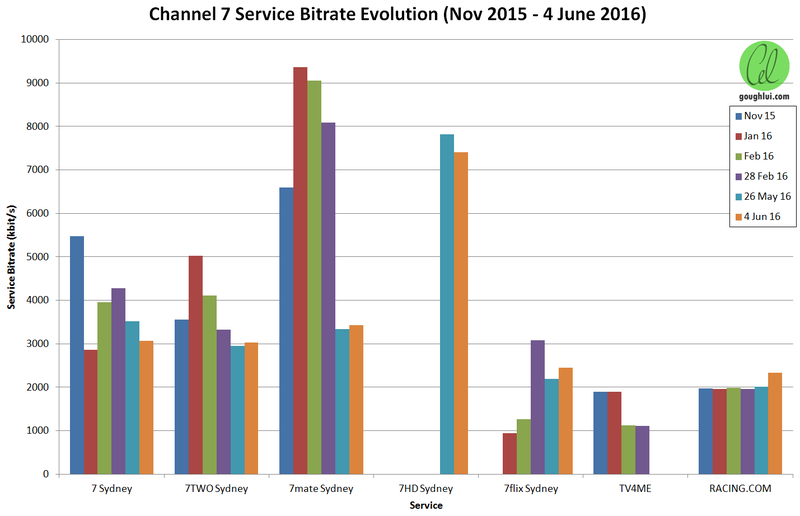 It seems that the main 7, 7TWO and 7mate are roughly running the same bitrates now. This entry was posted in Radio, Telecommunications and tagged digital tv, dvb, freeview, tv. Bookmark the permalink.